What real life locations are mentioned in songs, band names or album titles? Mary Chapin Carpenter's, "Down at the Twist and Shout"
Well I never have wandered down to New Orleans, never have drifted down a bayou stream.. The song refers to the singers love for cajun and creole music, though she lives in the north. Mary Chapin Carpenter's, "Down in Mary's Land"
East of Virginia where the bay meets a river Down in Mary's land The wind pulls your sleeve like a long-lost lover Whose heart can't understand How you ever could leave The view you behold Ain't it fine and ain't life grand When you don't need nothing But some beer and a bushel Down in Mary's land. The song is about the state of Maryland. This verse refers to the coast of the Delmarva (Delaware, Maryland, Virginia) peninsula, where a favorite meal is "beer and a bushel" (of steamed crabs). 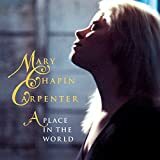 Mary Chapin Carpenter's, "How Do"
She mentions Texas, Paris, and Dallas. Mary Chapin Carpenter's, "Read My Lips"
It's not clear which turnpike she's driving on, but she passed New York City a couple of hours ago. Mary Chapin Carpenter's, "This Shirt"
This shirt was a pillow for my head On a train through Italy This shirt was a blanket beneath the love We made in Argeles. This shirt was lost for three whole days In a town near Buffalo Till I found the locker key In a downtown Trailways bus depot. She mentions Italy, Argeles (a city in the south of France), and an unnamed town near Buffalo, New York. New entries in this section are currently reviewed by lpg unit. Previous editors (if any) are listed on the editors page.